Hello everyone. Thought I'd say hello after stealthily browsing some of the posts in here for the last 6 months whilst trying to make my mind up. Finally decided to get a Macan petrol S (sapphire blue) today, picking up in 2 weeks. Cannot wait. Literally. Cannot. Wait. I will browse for more help and advice before asking any silly questions, having said that ... what do you kind folks (especially those with dogs and kids) use to protect the inside of the car (boot space) from dog hair and slobber (the dog and child kind)? Welcome and great colour choice!! Tell us more about the car you are getting , is it new or used? Hatchbag make very strong and durable boot liners to make the dog hairs easy to hoover up. Welcome. Exciting times. Do share your spec. I don't have any kids but do have a medium sized dog. I've got a Porsche high luggage compartment liner (95B04480015) which I had the dealer throw in gratis so make sure you leverage them for some freebies if you haven't already. It is like a large high sided plastic insert. It works well at containing any debris that the dog has on his coat but the downside is that if you ever need the back row down for loading, you need to take it out as it's rigid. I had Over The Top make me a custom backseat cover but they do boot liners as well. The quality of the material is excellent and it looks really good unlike some third party products. It has a soft rubberised back which isn't abrasive and I went for a sealed version with no seat belt cut throughs but you can customise your specification in various ways. I imagine the load liner will also be good and be more flexible than the hard shell. The front rubber seat mats have a glitch and that's they don't fit at all well on the driver's side. They sit on top of the dead pedal versus being properly cut. I have no idea why but imagine someone got the LHD cutting model wrong or something but it's pretty poor for a Porsche product. Weathertech do excellent back row seat mats - they're deeper with high sides so it's easier to contain any debris to not spill it in the car getting the mat out. I don't know why they don't do front mats though, I have no doubt they'd be better than what Porsche do. I'd recommend having the interior of the car detailed - sealants and hydrophobic coats will make a difference to spillage penetrating fabrics. If you have a tow hitch, you could always carry the kids in a trailer behind the car. Look forward to seeing pictures of the car. bhjvdb wrote: Hello everyone. Thought I'd say hello after stealthily browsing some of the posts in here for the last 6 months whilst trying to make my mind up. Finally decided to get a Macan petrol S (sapphire blue) today, picking up in 2 weeks. Cannot wait. Literally. Cannot. Wait. Welcome and congratulations.. Awesome colour.. (as I have got the same colour). Can't comment much on your other question as I have no kids or a dog.. Great car and hope you have many happy motoring mikes in it. This forum is great. I have been here for over 2 years now but only picked up my car last week. I also didn’t answer your question fully as to what I use to protect the inside of my Macan from my dog. 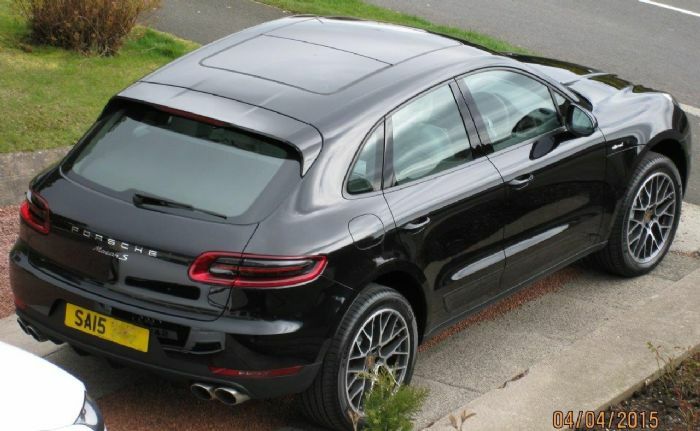 I got an additional £500 off the car because I am financing through Porsche and when I asked for a better APR they mentioned they get £500 income (document fee!?) which they decided to reduce my car price with as they cannot lower the APR. All smoke and mirrors in the end. Either way, I am very happy, they also gave me a much better trade-in on my Mazda CX5 than webuyanycar, which I did not expect. Sorry for posting this late but Porsche charge too high an APR. Maybe you can still change your finance option. I went with Clydesdale bank asset finance based on feedback from this forum. Best decision I made. They charge a 4.6% APR on a PCP.